The formation of Hawk Merlin Studios originated in the mind of the founder, David Bunker. David observed the traits, tendencies, characteristics, and personalities of Hawk and Merlin during a three year period of pheasant hunting trips in the 1990's to the "Willow Creek" area near Heppner, Oregon with their owner, Bruce Crowell. There was something special about Hawk and Merlin that stuck with David for two decades. When thinking of Hawk and Merlin over those many years, there was one word that became the identity of the memories: COLLABORATION. The foundation and soul of HMS is grounded in the spirit and intent of collaboration. The HMS Studio/Gallery is a platform and environment for collaboration to exist, occur, and thrive. As David was contemplating an endeavor to become a platform for his creative energies, the name Hawk Merlin Studios became the perfect choice. The progression from the hunting trips during 1993-1995 to the Grand Opening of Hawk Merlin Studios in Spring 2016 has been an amazing journey. For two decades David always knew he wanted to tell the story of Hawk and Merlin someday. But, he had no idea that it would lead to opening a Gallery/Studio opening in Stevenson, WA ,with an immediate portfolio of 22 active stories/projects to undertake. See a preview of the 22 active projects on the Writer's Den page. Although the exact future of HMS is unknown, one thing will hold true throughout the journey/adventure. All activities, partnerships, and intentions will always be grounded in a spirit of COLLABORATION, in honor of the memories of Hawk and Merlin. During the logo design process, David wanted to give the dogs a legendary feel, like president's heads on the head of a coin. As you will see in the logo, the dogs are posed intentionally with Hawk facing forward (focused on the details), with Merlin looking off to the distance (thinking of the possibilities). The creation of Hawk Merlin Studios was inspired by the spirit, collaboration, individuality, and relentless determination demonstrated by two legendary bird-hunting dogs, Hawk and Merlin. They canvased the wheat field canyons in Eastern Oregon in the 1990’s in an area near Heppner, Oregon, known as “Willow Creek”. The late November pheasant hunting conditions were cold and harsh. 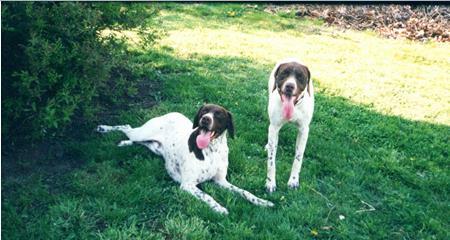 Hawk and Merlin were brothers with unique personalities and performance styles. Individually they had their strengths and weaknesses. Together, they made the unforgettable, ultimate, collaborative hunting team. HAWK: Hawk was always focused on the details. He would have his nose to the ground with intense concentration at the task in front of him, following the scent of a bird. You could really count on Hawk, as he was very predictable with a conservative approach, but focused and fierce like a hawk. This was his strength, but the weakness in this approach was that the birds sometimes would run ahead of Hawk while he was intensely focused and not considering the possibility that the bird had run ahead. His brother Merlin was the perfect compliment. MERLIN: Crazy Merlin. Always running ahead of Hawk. Always covering maximum ground considering every possibility of where the birds could be. The dust would fly in the distance, and he could pick up scents Hawk would miss. This was his strength. He was determined that no bird would escape his realm. His weakness was while he was considering all the possibilities, he wasn’t paying attention to the details and would sometimes miss a scent and run ahead of a hunkered down bird. His brother Hawk was the perfect compliment. AS A COLLABORATIVE TEAM: They were an amazing sight. Their individual nature, approach, skill, and talent was complemented by their willingness to collaborate as a team. They would keep an eye on each other. Hawk would lift his head to see where Merlin was ahead. Merlin would always look back to see where Hawk was. If one “pointed” the other would race to the point to complement and support the hunt. They also respected and honored each others point and would defer the glory to the lead point dog. Individually they were great, but together they were unmatched as a team. They were a collaborative team of brothers. With their owner Bruce Crowell, in their prime near Heppner, Oregon..